Inboxer – An easy way to spy on your employee’s emails? I first ran across Inboxer through their excellent Enron email exploration site. They offer a server appliance that sits inside a company’s firewall, analyzes all internal email, and offers a GUI interface to explore the messages. They have some sophisticated tools that let you see some common types of emails that management would be interested in, such as objectionable content, recruitment-related or by external contacts. They also let you set up alerts and triggers if particular conditions are met, such as unauthorized employees emailing messages that appear to contain contracts to external addresses. You can experiment with their UI through the Enron site, it seems to be pretty well laid out, and simple enough for non-technical people to use. They offer graphs of important statistics over time. There’s a set of pre-packaged searches for things management are commonly concerned about. 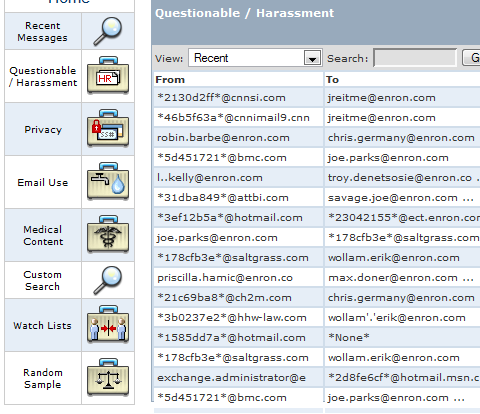 You can drag and drop any of them onto the main pane, and you’ll get a view of all the relevant emails. They’ve done a great job technically with Inboxer, it seems like a well-rounded service. I’m a bit disturbed that the this is what the market is demanding though. Despite it being pretty clear from a legal standpoint that the company has no duty of privacy, most people don’t treat their work emails as public documents. Some of the searches, such as those for recruitment terms, are clearly aimed at catching employees doing something they don’t want management to know about, but that aren’t aimed at harming the company. I get worried that it would be incredibly tempting to use this as a technical fix for a management problem. Instead of focusing on keeping employees from job-hunting by keeping them happy, just try and punish anyone who makes the mistake of using the company system in their search. I believe the Inboxer team has done their homework, they’ve clearly tried a lot of different tools, and this is the one that seems most successful. There’s a lot of legitimate uses, especially in regulated industries and government organizations, where there’s liability issues that require some email controls. I just wish that a less command-and-control, top-down approach was more popular. If Inboxer also offered a client-side version, I’d much rather work for a company that required that. It could make it clear which emails would be flagged and looked at, before they were sent, and help employees understand how public their work emails really are. Roger Matus, the CEO of Inboxer, has collected a lot of useful email and messaging news in his blog, Death by Email. I’d recommend a visit if you’re interested in their work.